I was thinking fondly of the campanelle pasta that I recently described, and decided to make it tonight. I sauteed two thin neon eggplants (skinned and cubed to 1/4" or so) and half of a red onion cubed to 1/4" pieces. When the eggplant was looking cooked, maybe after 5-7 minutes, I added a vegan apple-sage sausage, cut also into small pieces. Once the sausage was lightly brown, I added half of a large red bell pepper and, a minute or two later, a small jar of tomato paste. 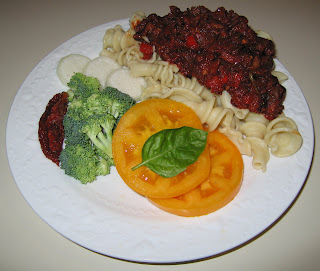 I simmered then, adding fresh basil and oregano from my garden, as well as dried parsley, salt, and crushed red pepper. It tasted great over the pasta! I enjoy fresh, raw radishes, and always toss the greens into my compost. 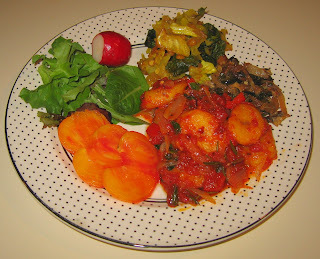 I was wondering if the greens could be enjoyed, and found that, indeed, the whole radish could be cooked. Based on some ideas that I had read about, I started with a bunch of (colorful Easter Egg variety, in my case) washed radishes. I chopped the radish roots into 1/4-1/2" cubes and sauteed with about half of a red onion, cut into medium slivers. As the radish softened after about 4-5 minutes, I threw in the radish greens, roughly cut into thirds. I cooked for another few minutes, then added about two tablespoons of water, covered, and simmered on low heat for just about two minutes, when the greens were still full of color. I served, mixed with some salt. 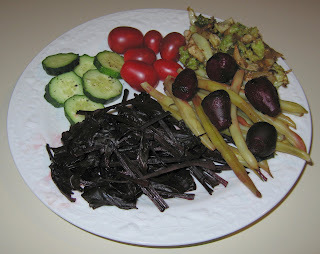 It was interesting - I liked it and may try once in a great while working with other ideas for cooked radishes. As I described in early July when I made my "green dinner", I found an interesting Fogile d'Oliva pasta, and cooked with it again today. I made a simple sauce with a little olive oil and artichoke hearts. 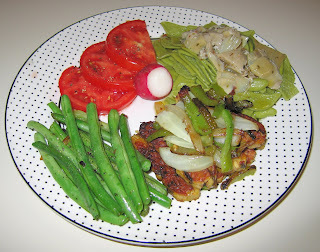 I also served some green beans, cooked briefly, as well as yummy sauteed tempeh. 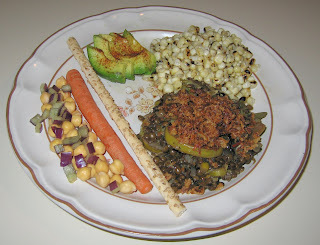 It's easy and nutritive cooking with French green lentils. The basic recipe is to bring a combination of water and lentils, in a 3 (water) to 1 (lentil) ratio, along with salt and spices like turmeric or garam masala, to a boil, then simmering, covered, for about 35 minutes. One can also add vegetables; I typically do a brief sautee and then add the water and lentils and go from there. I made such a dish with squash today, and also served corn-off-the-cob. When I was in California recently, I purchased an avocado slicer, which I tried today with mixed success - perhaps the avocado was too soft, and the ends didn't come out great. It was a good meal, in any case. Last weekend, we had picked up some small red baby beets from a local farmer's market. I prepared them simply steamed for about 20 minutes like I did last March, including the "greens" (actually deep reds) in the last five minutes or so. I also steamed some yellow beans from the market. I made a simple saute with Savoy cabbage and onion, but also included half of a jalapeno which proved to be particularly hot. Compounding the heat, I mixed in some jerk seasoning (and salt); it was a bit too hot. I liked the other dishes, and even the cabbage when I pulled out the jalapeno, but was surprised that (perhaps for the first time in the 4+ years of cooking for her) my wife didn't particularly like tonight's meal. I'll do better for her! It seems like we've been eating out a lot. Yesterday was the last of my six week photography class in Carrboro (NC); a student joined my wife and me at Sage Cafe; it had been too long to go without their fabulous pomegranate reduction with tempeh, which I, as almost always, had. We were in Atlanta on a very short visit for an appointment that my wife had. We left around 3:30p (allow 8 hours - 6 1/4 without stops) on Tuesday, stopping a couple hours away in Charlotte at Meskerem, probably my favorite Ethiopian restaurant (even compared to the good ones in the Adams-Morgan section of Washington, DC); we had what we always do, a vegetarian combination plate (and an avocado salad appetizer). After her morning appointment on Wednesday, we met up with a friend of mine and had lunch at Cafe Sunflower, an all-vegetarian restaurant that I used to frequent when I made a number of business trips to Atlanta in the late 1990s - I had a good polenta dish. We made it late in the evening back in Charlotte for good California-style pizza (vegan dough, many vegetarian toppings) at Wolfman's Pizza. Yesterday, I hosted a photo competition at the restaurant where we have Thanksgiving, Cafe Parizade. I submitted the following tentative menu, which the chef more or less provided, with some nice enhancements. 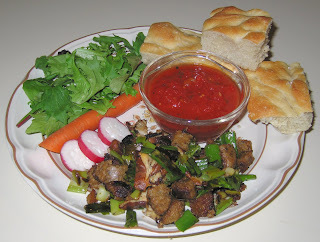 Appetizers: Grilled flat breads with roasted red pepper, eggplant, and hummus spreads; Lentil-brown/wild rice cakes with lemon tahini; Raw vegetable plate. Main Courses: Avocado salad; Gazpacho [I don't think he had this]; Lime-marinated seared seitan with peppercorns and fig glaze; Rosemary-roasted garlic whipped potatoes & mushroom-onion gravy; Kale rollups with polenta and artichoke hearts [ref: my food blog from July 2006]]; Roasted corn-off-the-cob accented with smoked poblano peppers and cumin, served with a light sprinkling of lime and salt; Seared portabello mushrooms served with herbed mixed whole grain rices and topped with a maple-citrus syrup. Desserts: Fresh seasonal fruits; coconut-milk based cherry cake. I think everybody enjoyed the meal! We had some leftovers, and I served them tonight. The meal was accented by thin Grissini Stirati di Torino breadsticks, as well. The good news is that my wife and I are having a large gathering at Cafe Parizade again next Sunday to share some updates and see many friends (a good annual event?). The family reunion was officially over with our dropping my aunt off at the airport today. After she left, I joined my parents at an Indian grocery store, and found an interesting looking Malyasian style Dal Parantha (bread stuffed with lentils) in the frozen section, made by Deeps Foods. I also picked up what my Mom said is a kind of cucumber-like vegetable. 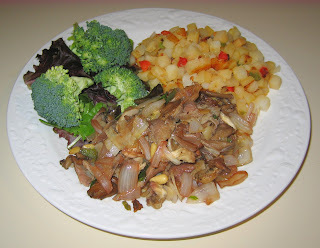 I made a simple zucchini saute and boiled some potatoes I had from a local farmer's market. 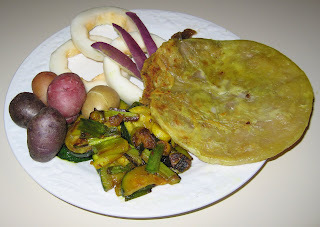 I served the vegetable sliced (it tasted like a non-sweet melon and wasn't very appealing) and heated the parantha on a griddle with a tiny bit of oil. I loved the parantha! 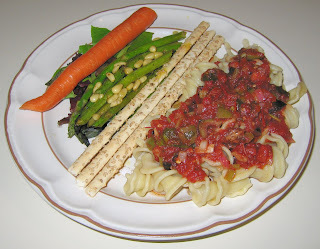 I cooked a few vegetables with the marinara sauce and served it atop the cooked pasta - it was very good! I also had purchased recently some interesting very thin breadsticks, Grissini Stirati di Torino breadsticks, a specialty from Turin. They were also very good and nicely crispy. I also briefly sauteed some asparagus and pine nuts as a good side dish. I made a tasty chard dish by sauteeing in tangerine olive oil a small sweet onion, cut into half moons. A few minutes later, I added the stalks of a bunch of green chard, cut into maybe 1" lengths. Giving this another few minutes to cook, I then added maybe 1/2 cup of cabbage, cut into small pieces; two or three minutes later, I added the chard leaves, roughly cut into 1 1/2" or so squares, along with chopped lavender bell pepper. After two minutes or so, I added a teaspoon or so of pine nuts, a pinch or two of cumin seeds, and a pinch of turmeric. I stirred for half a minute, giving the cumin a chance to brown a little, then added 1/4 or so cup of water. I let the water distribute the turmeric and soften the dish a bit, then served with a little salt. I recently picked up some caribe potatoes, purple skinned with white flesh, said to be good mashed. I did just that; I cut two medium-large caribes into small squares (maybe 1/2" or smaller cubes) and boiled them for about a half hour. I then mashed them and mixed in almond milk (I had wanted to use hemp milk, but we were out), some Earth Balance margarine, a little roasted garlic olive oil, salt, black pepper, a very small onion that I had chopped finely, and maybe 1/8 cup Lars' Own crispy onions. It was a good dinner! Yesterday after my photography class, I stopped at my parents' to visit with them, my brother's family visiting from California, and my aunts visiting from Connecticut. I had planned on eating at home, but at their insistence I enjoyed some of their leftovers, such as a Marathi Indian spicy appetizer and other Indian dishes. On Sunday, I had also eaten there - dhal (lentil soup), rice, and a variety of other Indian dishes. At A Southern Season's big annual sale a few days ago, I found some interesting Fogile d'Oliva pasta - pasta shaped like an olive leaf and, due to being mixed with spinach powder, being green in color. 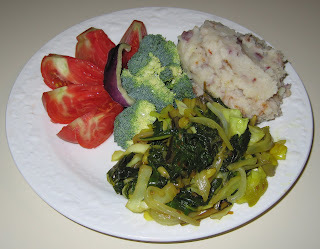 I came up with the idea of making a green dinner like I did with the white dinner back in February 2007. I used some roasted garlic olive oil that I had also purchased at the sale to sautee a small onion cut into thin half-moons. Just a minute or so later, I added two zucchinis, each cut into half and then, lengthwise, thirds. I let the saute go for a few minutes till the zucchini was just starting to brown, then I added maybe a dozen basil leaves and a litte rosemary and oregano. I cooked for another few minutes, then served atop the pasta. I also cooked some onion and spinach in a little roasted garlic olive oil, and asparagus spears in tangerine olive oil. 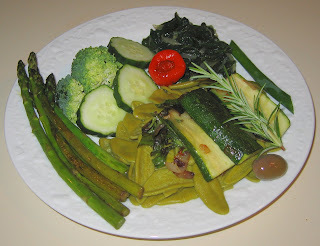 Several other greens accented the meal, such as olive, spring onion, cucumber, broccoli, and a rosemary sprig. I was set to serve avocado, but thought that we would have enough food (we did). I added a spot of red by way of a pickled pepper. It was a fun and good meal that we shared with another aunt from Connecticut who just flew in a few hours earlier. 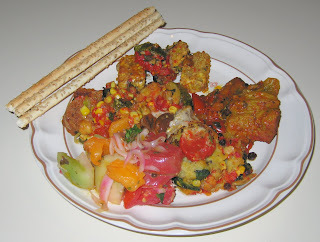 Tomorrow is the vegetarian society's 4th of July picnic; I don't yet know what I'll make. Perhaps we'll be eating at my parents' the following day as the family reunion is underway. Happy 4th of July! Over the weekend, our local coop was offering sample tastes of a locally made marinara sauce by Thomas Gourmet Foods - it was tasty! Needless to say, we came home with a bottle. 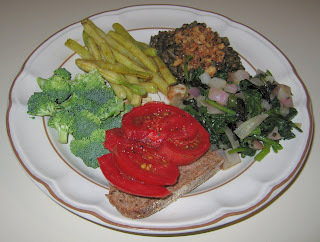 I was in a bit of a rush to get to tonight's ADF show (a very nice one with Keigwin and Company -- Larry Keigwin really seems to enjoy performing in his whimsical yet sophisticated dances -- and Battleworks, which had a particularly strong last piece accompanied with heavily percussive music), so used several leftover dishes as a base (Bengal Lentils with Kale and Cauliflower and Limed Purslane-Tempeh). To make our main course, I cut several small onions (equivalent to one medium) into 1/4" half moons and sliced a well ripened plantain (if you want sweetness, it's best to wait till the skin turns almost fully black, which I did; otherwise, it can almost be potato-like) into thick slices of maybe 1/2" thickness. I started sauteeing over medium heat the onions and just a minute or so later added the plantain. After 7-9 minutes when the plantain was gently browning, I added maybe a teaspoon of rosemary needles, cooked for another minute or so, and then reduced the heat to a simmer. I added maybe 2/3 cup of the marinara sauce, as well as maybe 8 leaves of basil, hand torn into maybe quarters, a little salt and pepper, and some crushed red pepper. I let it simmer for maybe 5-7 minutes to thicken the sauce a bit, then served. It came out well! Yesterday, we had South Indian dosa at my parents' house again. Yum! By the way, while I was writing this post, the author of an article 57 Health Benefits of Going Vegan emailed me - check out this well-written article! This being a Monday, I taught photography in the nearby town of Morrisville and my wife took her Sanskrit class in that town, too. Before her class, she ate at my parents' home, so I was on my own for dinner. On my way home from class, I was fondly remembering the oyster mushrooms that I had prepared in early June, and decided to stop at a store and buy some more oyster mushrooms. I bought a big bunch and made a simple saute along with onion, a bit of herb, jalapeno pepper, salt, and dried thyme. When it was cooked, I added a little Merlot wine and let it cook into the mushrooms. I served with some Potatoes O'Brien that I had cooked from a frozen mixture. I enjoyed the dinner!